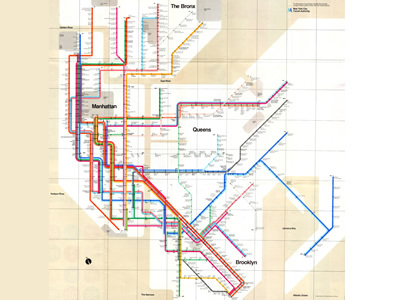 In 1972, the renowned Italian designer Massimo Vignelli redesigned George Salomon's New York Subway map, which persisted until 1979, when superseded by Michael Hertz's design. It was a marvelous conceptual map, and it was easy to read. It was a tool for navigating the subways, although not one for navigating the city streets. Out with the complicated tangle of geographically accurate train routes. No more messy angles. Instead, train lines would run at 45 and 90 angles only. Each line was represented by a color. Each stop represented by a dot. There was an obvious influence from the London Underground map, originally created by Harry Beck in 1933, however, Vignelli took it one step farther, in creating the now-famous intertwined wiring-diagram map of New York's vastly complicated subway lines. The result was a design solution of surprising beauty. However, Massimo Vignelli reached a level of abstraction that quickly ran into problems. To make the map work graphically meant that a few geographic liberties had to be taken. For instance, Vignelli's map represented Central Park as a square, when in fact it is three times as long as it is wide. 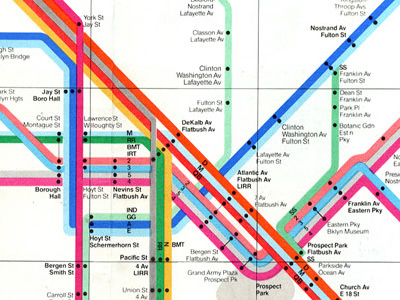 It is said that Vignelli had planned a second, complementary map that would have been more tied to the actual above-ground geography, but the city never let him do it. I am searching for a way to purchase the vintage original maps 1972 and 1979. How can I do this?? ?